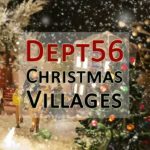 The Dept 56 Christmas Snow Village consists in a large variety of houses and figurines. 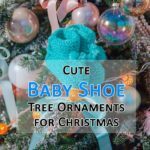 They make the perfect choice for you if you want to create a Christmas Village wonderland at home this holiday season. 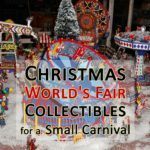 As you will see all along this page, The Christmas Snow Village houses and figures are delicate and carefully crafted by hand. 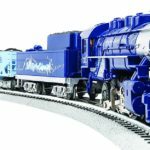 With this huge collection of Christmas Snow Village houses and figurines, you can create on-demand stories for the children. So, let’s not wait any longer and start our journey across this holiday village wonderland. All stories begin the same way: “once upon a time”. Well let’s pretend that I live in Snow Village. Actually, this is a very small village in an area nobody never visited. My house is the one with many snowmen displayed all around. It’s December 24th in the morning and a stressing and challenging day has begun. 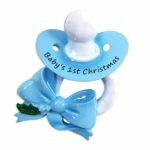 My Christmas shopping is starting. 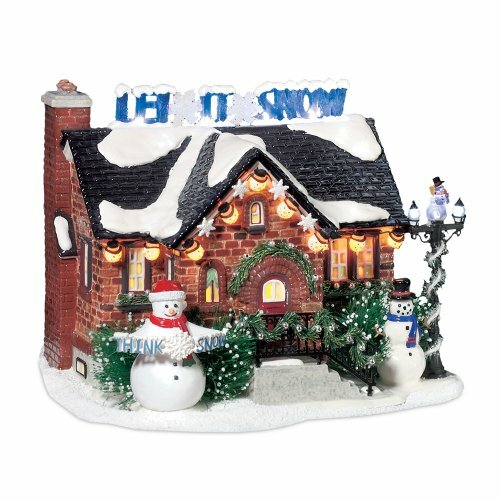 The 9.5″ x 8.25″ x 7.5″ Department 56 Snow Village Snowman House is made of ceramic and comes with light. 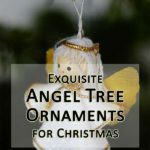 Take a look at these detailed evergreen accents and the snowmen. You can’t miss the house because it features a “Let it snow” sign on its roof. First thing in the morning, a cup of warm coffee. And is there a better place than the Red Cup Café on Main Street? Because I don’t have too much time ahead of me, I’ll order a take-away cup coffee. 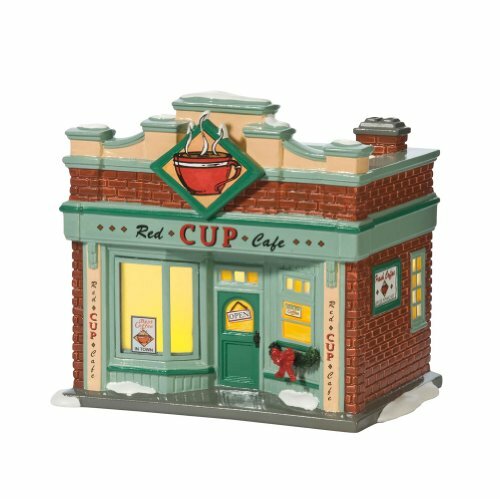 This lovely Department 56 lit porcelain house “Red Cup Cafe” is a part of the Christmas Snow Village collection. 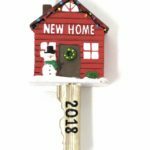 The building comes with light cord and measures +/- 6.25″ x 4.75″ x 5.75″. On my way to the local Inn to make sure the family made themselves comfortable. Uncle Bob and Aunt Annie came from their Loon Lake Cabin located in Snow Forest and booked a few days at the Eden Prairie Inn, the local hotel. 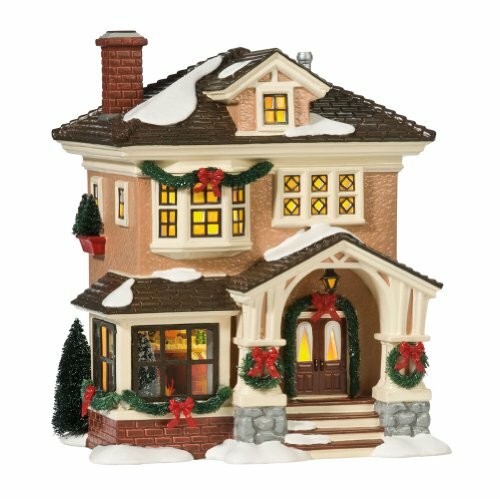 The 7″ x 7 3/4″ x 9 1/2″ Eden Prairie Inn is a new house in the Dept56 Snow Village collection. It’s made out of porcelain and comes with a light cord and light bulbs. 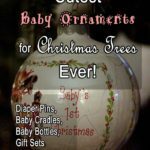 You will also find a set of 4″ x 2.5″ x 3.25″ characters in the pack. The Christmas Snow Village’s bakery produces delightful pastries. I ordered some sweets from this shop: a chocolate yule log, cookies, a plum pudding and fresh-baked bread for the dinner. Can you feel the delightful smell of the excellent pastries and breads yet? 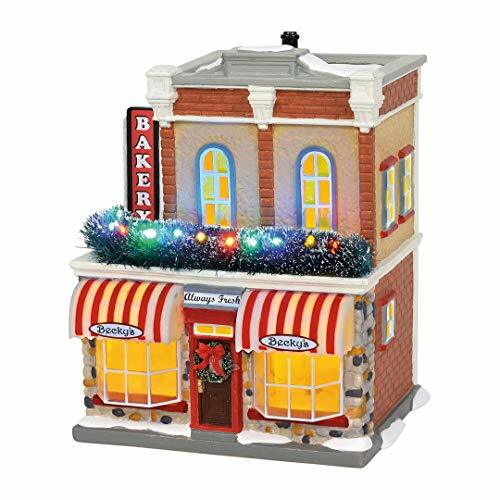 Don’t overlook this exquisite lighted 11.5×7.75×6.75″ bakery building for the holiday season in your village display. 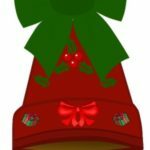 Main Street’s local theatre is playing Nutcracker. We will attend the show tomorrow night, what a delightful way to end this family gathering. 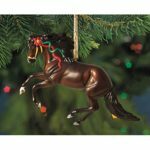 The Opera House is beautifully decorated with Christmas wreaths and garlands and we can see a big Nutcracker on the porch. 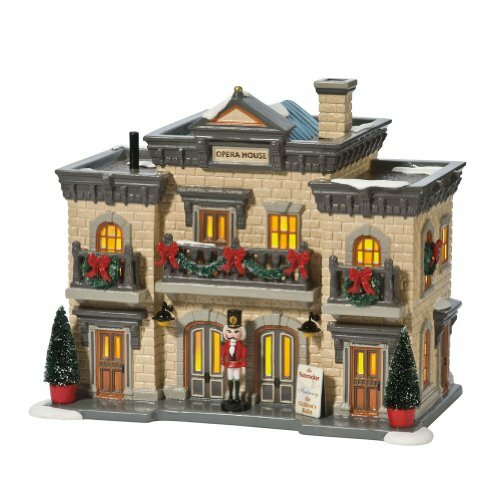 The 10″ x 6.5″ x 8.25″ Nutcracker Playhouse is a ceramic lit house made by Department 56. The building is part of the Original Snow Collection. Comes with light cord. During my shopping, I take some time to say hello to other Snow Village inhabitants. Young or old, it doesn’t matter, they gather everyday, regardless of the season, on Main Square. Sitting in the Village is a set of 3 banks and 6 sitting figurines. 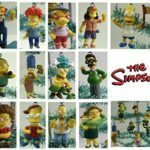 All of them are made out of bisque porcelain. 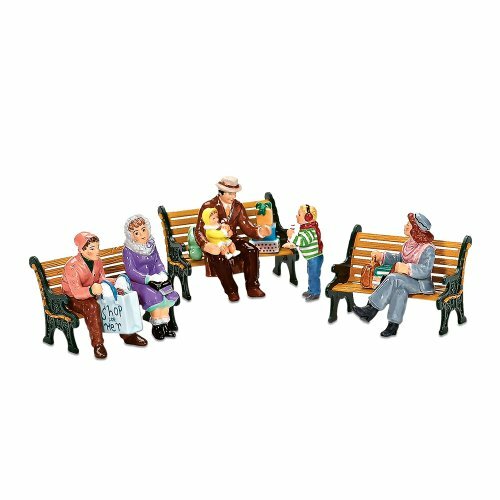 These figurines can be used on other Snow Village seats, which enables you to enlarge the sceneries. 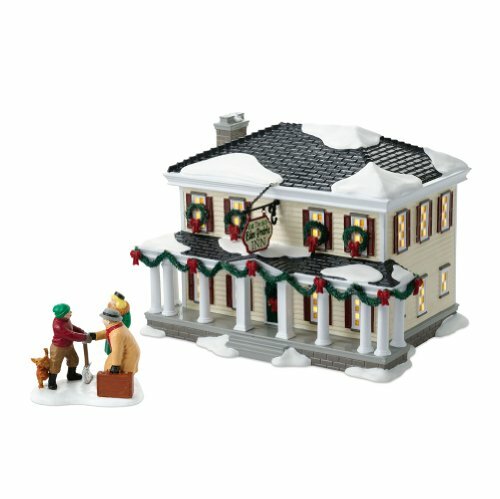 Santa Claus also lives in the Christmas Snow Village. So it’s no wonder why I’m heading over to his home. Here’s Santa’s wonderful house. Admire the bright colors – the house is entirely decked for the night. 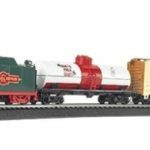 The train is just coming back from the magical toy manufacture. 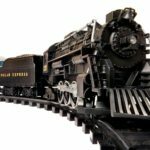 As you can see, it’s filled with many fantastic toys the kids will enjoy to discover tomorrow morning. 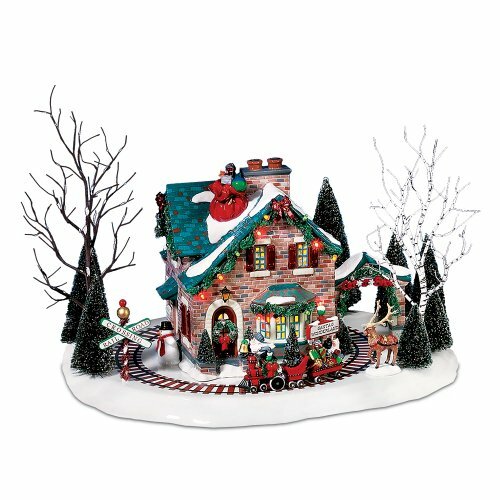 Department 56 Snow Village Santa’s Wonderland house is a 14″ x 11.5″ x 8.5″ hand-painted ceramic house featuring realistic brick siding. 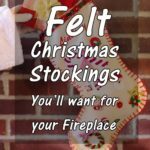 The house is lit. 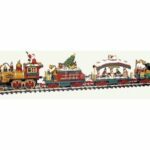 The train, track, reindeer and sisal trees are included in the set. The whole family gathered in Grandma’s house to celebrate this magic evening. It’s not every day that we are all together. Last time was on Thanksgiving. Twice a year a family gathering isn’t too much, isn’t it? The Christmas at Grandma’s House is a Department 56 lit house made out of porcelain and decorated in the inside with wreaths and garlands accents. 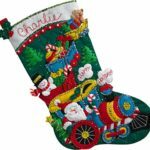 Measures 7.25″ x 6.25″ x 8.5″. It’s 10 PM? 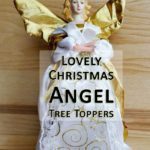 Christmas Eve and we’re all heading to the Holy Family Church to attend the Christmas mass. Snow Village’s choir sings Silent Night, and Little Town of Bethlehem. Suddenly, we find ourselves chanting Christmas songs and carols. 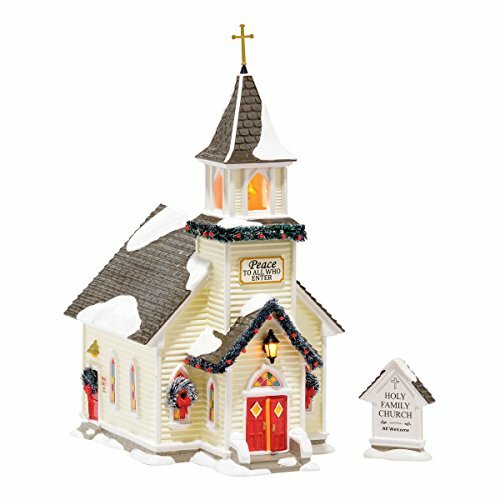 This amazing 10.63″ miniature church is made out of porcelain and includes light cord so that the lighted church brings a touch of realism to your village. Dept 56 the Holy Family Church is made out of ceramic and is painted by hand; it features colored windows and a slightly opened front-door. 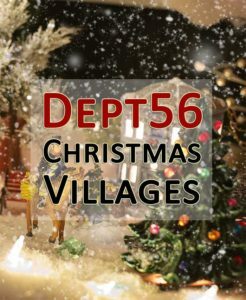 Tagged christmas houses, christmas village, Department 56 Snow Village, dept 56 buildings, dept 56 lit houses, dept 56 xmas village, dept56 Christmas village, snow village houses.